Snow is no stranger here, there’s plenty of it to be enjoyed each winter! Skiing, snowshoeing, and snowmobiling opportunities abound, with some available right from your doorstep. The Pinery Lakes X/C Ski Trails located off of Indian Cemetery Rd 5 miles north of L’Anse on Main St/Skanee Rd have 3.9 miles of groomed trails for the winter skier. 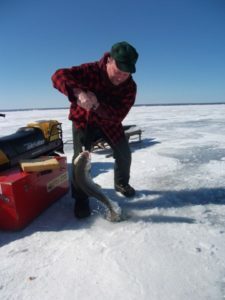 Try your luck or ply your skills ice fishing on Lake Superior’s Keweenaw or Huron Bay, or on the many inland lakes in Baraga County. Don’t miss the ice fishing tournament held each early January on Vermilac Lake located off of old US Hwy 28 in Covington. There are 145 miles of state-assisted and groomed trails in Baraga County. Information concerning snow conditions in Baraga County can be found at our Snow and Trail Report. Enjoy Cathy’s Path and Soup’s Loop for hiking, biking, and snowshoeing. Parking is located on the Skanee Road, 2 miles northeast of downtown L’Anse and just 800 feet past the L’Anse Township Park entrance. For more winter recreation ideas, visit http://www.uptravel.com/.